These photos were taken from January to April 2010 at Johnny's Research Farm in Albion, Maine. Included are shots of our Quick Hoops™ Trial and a series of photos from our Mâche trial. We planted most of these crops in the fall, and covered them with low tunnels, fabricated with Quick Hoops™, Row Cover and Tufflite Greenhouse Film. Quick Hoops™ can be used to extend the growing season for cold-hardy crops with a very late season harvest, as well as to overwinter them for the earliest possible spring harvest. 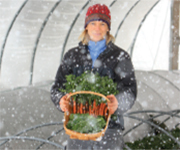 For more information about winter harvesting and overwintering, including details on scheduling, methods, and Johnny's recommended crops and varieties, see our Winter Growing Guide.